WHITE RABBIT PRODUCTION CEL WALT DISNEY STUDIOS GOUACHE ON CEL, 1951. Original hand inked and hand painted production animation cel of the White Rabbit from "Alice In Wonderland, " 1951, Walt Disney Studios; Set on a lithographic background; Unframed. "Alice's Adventures in Wonderland" (commonly shortened to "Alice in Wonderland"), is a 1865 novel written by English author Charles Lutwidge Dodgson who wrote under the pseudonym Lewis Carroll. Disney reworked the story to fit with both a younger audience and a time frame suitable for an animated film (it's run time is only 75 minutes). Kathryn Beaumont, who was born in London England, was just 10 years old when she was chosen for the voice of Alice. Walt Disney personally cast Beaumont after seeing her in the film "On an Island with You, " in which the child actress had a small role. Disney was so impressed by her that she was also chosen to be the model for Alice, and would also go on to provide the voice for Wendy in "Peter Pan, " 1953. Beaumont has also reprised her voice acting role as Alice in two episodes of the animated series, Disney's "House of Mouse, " and as both Alice and Wendy in the video game Kingdom Hearts. She did not retire as the voice of Alice and Wendy until 2005, when her role for these two characters was taken over by Hynden Walch. Initial design for the character of Alice was accomplished by Mary Blair during the storyboard phase and also by Les Clark. Alice was animated by Ollie Johnston, Don Lusk, and Marc Davis who animated her for the tea party scene. The White Rabbit is one of the most well known and referenced fictional characters in Lewis Carroll's book Alice's Adventures in Wonderland. " He first appears in chapter one, wearing a waistcoat, and muttering "Oh dear! I shall be too late! Alice follows him down the rabbit hole into Wonderland, and encounters him again when he mistakes her for his housemaid Mary Ann. Soon Alice becomes trapped in his house after growing too large. The Rabbit shows up again in the last few chapters of the book, as a herald-like servant of the King and Queen of Hearts. However, in Walt Disney's animated version of the story, the White Rabbit seems to be the most logical of all the Wonderland characters; and appears throughout the film to lead Alice along further into Wonderland. The Rabbit is perhaps most famous for the little song he sang at the beginning of the film - I'm late! For a very important date! No time to say hello, goodbye! He was animated by various animators including: Fred Moore, Ward Kimball, Judge Whitaker, and Wolfgang Reitherman. But most of the work was done by either Fred Moore or Ward Kimball; both of whom were wonderful at bringing this type of exaggerated character to life. The White Rabbit was voiced by American Radio and Voice Actor Bill Thompson. Thompson had an extraordinary career spanning from the 1930's until he passed away in 1971. He worked extensively for Walt Disney Studios, and can be heard in many shorts and features, often in either dialect parts or a variation of his famous and masterful Wimple/Droopy voice. For "Alice In Wonderland, " he was the voice of both the White Rabbit and the Dodo. He went on to be the voice of Mr. Smee (and the other pirates) in "Peter Pan, " and also King Hubert in Sleeping Beauty. Measurements: Size - White Rabbit: 3 x 3 3/4", Image 9 1/4 x 10 3/4". Condition: See pictures of the actual cel, which is in excellent overall condition, as shown by the pictures above! All items we sell are from a smoke-free/mold-free home/workplace and are in excellent condition unless otherwise noted. I own every work pictured for sale and I stand behind every item. Please follow/bookmark me as a favorite and keep and keep checking back for more items for sale in the coming weeks. For now, please check out my other Animation Drawings and Cels and other original modern and contemporary artwork for sale! 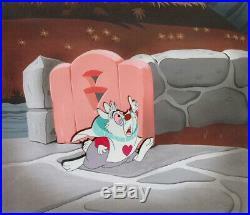 The item "1951 DISNEY ALICE IN WONDERLAND WHITE RABBIT ORIGINAL PRODUCTION ANIMATION CEL" is in sale since Sunday, March 24, 2019. This item is in the category "Collectibles\Animation Art & Characters\Animation Art\Production Art". The seller is "shadowline" and is located in Durham, North Carolina. This item can be shipped worldwide.